NEW HOME: Ex-British Gurkha soldier Bhagi Man Gurung is in a hurry to finish rebuilding his new house in Barpak before the rains. The tin shelter where his family spent a year is on right. The sun had set, and it was getting dark in Barpak, but even after working all day, ex-British Gurkha soldier Bhagi Man Gurung showed no sign of fatigue. He was overseeing a group of young men rebuilding his family home destroyed on 25 April last year. 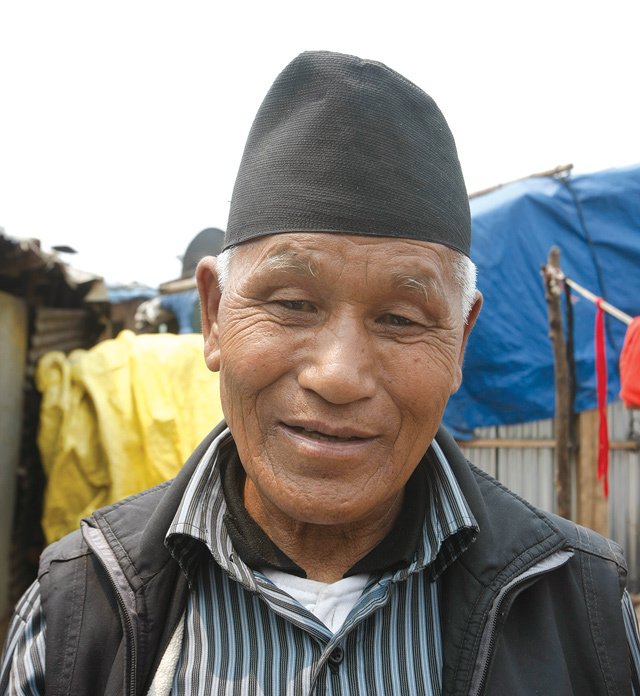 As Nepal prepares to mark the first anniversary of the earthquake in Barpak, the 77-year-old pensioner is in a hurry to move into his new house. He spent monsoon and winter in a flimsy tent in the past year, and does not want to endure the same hardship this year. This scenic village in Gorkha district bore the brunt of the earthquake last year, and most of its 1,500 houses were flattened. He could not rebuild his house on his own, and the National Reconstruction Authority (NRA) was taking too long to start distribution of promised Rs 200,000 housing grants. The NRA is preparing to distribute the first installment of the housing grants in Barkpak next week, commemorating the earthquake anniversary. But many survivors here are not waiting, they have either already rebuilt or are rebuilding their houses. Barpak became famous when one of its sons, Gaje Ghale, won the Victoria Cross for his bravery fighting the Japanese in Burma during the World War II. Many followed his footsteps, and Barpak is still known as a village of the brave. Sher Bahadur Gurung did not serve in the British Army like his neighbours, but is retired from the Indian Army which hasn’t been as generous. Neither has the Nepal government, but he is not waiting for help and started rebuilding with his saved up pension money, and is planning to move in before the rains come in June. The government has identified 1,447 families as earthquake victims in Barpak. However, Barpak VDC secretary Chet Prasad Amgain says all families who have got earthquake victim ID cards will not claim housing grants. “Some are capable to build on their own,” he says. 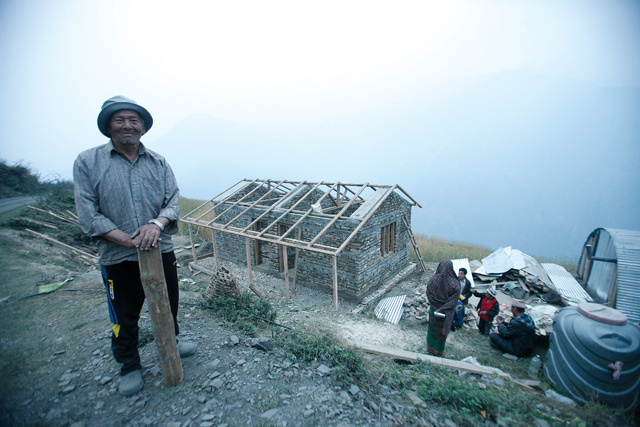 Sher Bahadur Gurung did not wait for the Rs 200,000 grant to rebuild his house. The earthquake’s widespread destruction of Barpak’s mud and stone houses was also a wakeup call for the people here, who are building back stronger structures. Binod Ghale, 40, had been working as a mason for the last 15 years, but he did not know how to build quake-resistant houses. After the earthquake, he got training in reinforced masonry and is now using his new skills. “If it had not been for last year’s earthquake, we would have not been aware of the new technique,” he says. 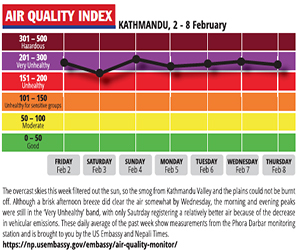 Barpak was already a popular destination for backpackers, and many here offered homestay rooms. Ironically, the earthquake has made it even more popular. New lodges have come up to cater to the hundreds of journalists and volunteers and relief workers who flocked here in the past year. Before the earthquake, Barpak had three hotels, now it has more than a dozen. We have to market the competitive advantage of traditional varieties of Nepali rice. There is a lesson to be learned from the unlikely overlap of refugees and international trade.